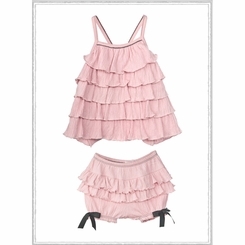 She'll be cute as a button in this sweet and frilly outfit. Tiers of soft ruffles decorate the top, and the open back ties closed with a black satin ribbon. The bloomers are decorated with black bows and contrast stitching. Cotton-spandex-nylon. Machine wash. Made in USA.